George Henry Cole enlisted in Wokingham, Berkshire. He may have taken work as a groom there. 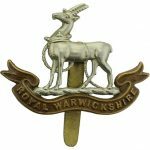 The Warwickshire Regiment moved to Italy 24 November 1917 to strengthen the Italian Resistance and was involved in various actions including the Battle of Vittorio Veneto. George Henry Cole was descended from the Cole family of Hennock.His father, George Herbert Cole married Ellen Elizabeth Dist in 1895. They lived at Cockington and then moved to St Marychurch, Torquay. Census returns show George Henry as being born in St Marychurch which was then within the Newton Abbot registration district and so his birth is registered in Dec 1896, N.A., vol 5b, p 135. The 1911 census shows the family together at Great Wotton, Bow, where George Herbert Cole was a coachman and his son, George Henry was a groom. Ellen’s father, Henry Dist, 74, was living with them.